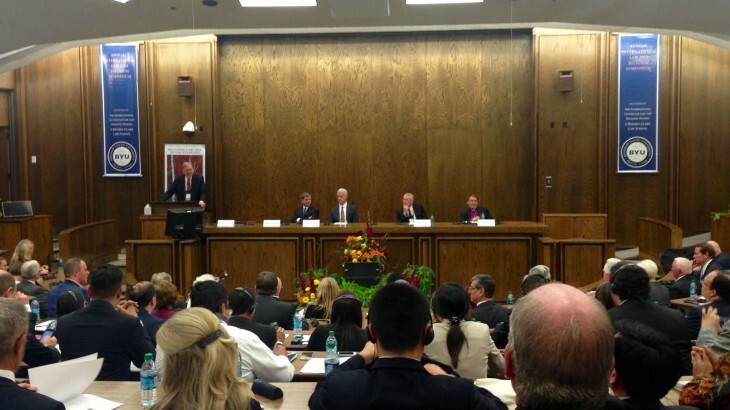 Provo, 8 October 2015—Organised by the International Center for Law and Religion Studies and held at the Brigham Young University in Provo, Utah, USA, the 22nd Annual Symposium considered the role of religion and religious freedom in resolving social and political conflict. Around 90 scholars, jurists, and political and civil society leaders from around 40 countries explored the relationships and tensions among religion, law, and social stability at the event held from the 4th to the 7th of October 2015. Professor David Little and Dr. Gunnar Stålsett opened the conference with thought-provoking and inspiring addresses. Professor Little is Emeritus Professor at Harvard Divinity School and a Fellow at the Berkley Center for Religion, Peace, and World Affairs, while Dr. Stålsett is a Moderator at the European Council of Religious Leaders, as well as International President of the World Council of Religions for Peace. Gunnar Stålsett highlighted some issues of major concern for both law and religion as they relate to social harmony. This included climate change, human right to peace, impunity, freedom of religion, nuclear arms, and death penalty. On the last day of the Symposium, Ms. Faith Delos Reyes, Research and Project Coordinator of the HRRC, presented key findings of the the Centre’s Keeping the Faith: A Study of Freedom of Thought, Conscience, and Religion in ASEAN. After giving a broad overview of religious diversity in the region and the aims of the ASEAN, specifically with regard to freedom of religion, Delos Reyes discussed the international commitments made by ASEAN Member-States in relation to freedom of religion, their constitutional commitments, as well as the relationship between religion and the state as manifested in their respective constitutions and key state policies. Keeping within the theme of the Symposium, she also shared findings from the report that highlighted situations of social instability in the region and discussed some of the key factors that are seen to contribute to them, specifically: politicisation of religion, ethno-religious nationalism, and weak rule of law. ASEAN, News, Vulnerable Groups. permalink.